A two-story, 3-ton ornamental baseball fell off the North side of St. Louis Busch Stadium, at 9:00 pm last night, crashing through Clark Avenue. No one was hurt in the incident but the errant baseball impacted the street with such force that it put a forty-foot crater in Clark Avenue, narrowly missing two parked cars. The street will be temporarily shut down until city officials can decide how to remove the ball and repair the street. The Stadium sustained no damage as the ball rolled off it’s footing atop the northern edge of the structure. The impact was felt five blocks away on the St. Louis Riverfront where witnesses said the Mississippi river actually flowed backwards for thirty-seconds. Late night winds of change were blamed for dislodging the ball and putting it into play. If the ball had been hit from home plate, it would have been a towering five hundred and sixty foot shot over the left field wall. St. Louis City Street Crews spend the night trying to figure out if the ball landed in fair or foul territory and if it was in fact fair how they should score the hit. One witness said it was like the baseball Gods were starting the season a few days early. Grady Phelan, of South County, said he heard a loud crack, like a giant wood bat hitting a fastball in the sky. When he looked up at the stadium the out-of-this-world ball came rolling over the edge. “My first reaction was to try and catch it. I’m thinking I gotta get that ball signed by the guy who hit it.” Fortunately for Phelan, he was standing across the street in front of the St. Louis Cardinals Hall of Fame when the ball crashed to the pavement. Busch Stadium officials could not be reached for comment this morning but players in Spring Training reacted to the news, relieved that the ball landed outside of the stadium and not on the field. “If that thing had taken out the visitors bull pen, I wouldn’t have shared ours with any of those pitchers from Houston. They’d have to use that softball field in ballpark village to warm up.” said one pitcher. A city official from the streets department said the weight of the ball could prevent it from being removed from the massive Clark Ave. crater. 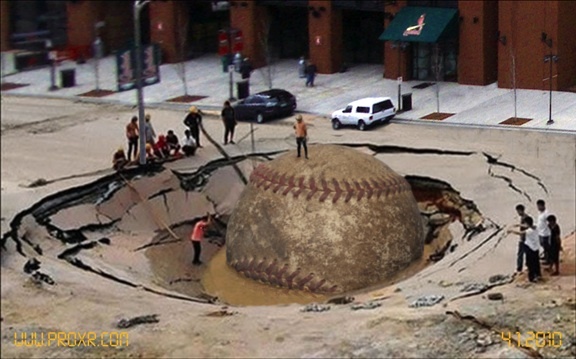 “We may have to pave around it and make it into some kind of a monument, I just don’t know yet.” Officials hope to have the ball cleanly fielded from the street and repairs completed in time for the April 12th opening day game against the Houston Astros. An interesting side note, the ball was created by local St. Louis Company, Giant Project, Inc., which is partially owned by one-time New York Mets pitching sensation Sidd Finch, who could not be reached for comment.